DC metro-area companies and organizations are seeking dynamic students across the GPA spectrum who plan to access and graduate college. Every Friday (and some other days as well), the DCPS College Readiness Initiative will share scholarship opportunities from organizations seeking DCPS scholars to award scholarships, resources, and/or mentorship to support their college matriculation and graduation plans. 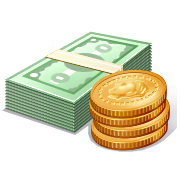 Students and families should consult their school counselor to learn how to access comprehensive scholarship information through the school’s Naviance account and learn about other scholarship resources (e.g., C3N, Fastweb and UNCF). The Rev. Absalom Jones (1746-1818) was born a slave in Delaware. He eventually purchased freedom for himself and his wife, taught himself to read, founded an insurance society for Blacks and nursed yellow fever victims during an epidemic in his hometown of Philadelphia. He was ordained a priest in the Episcopal Church 1802, becoming the first African-American priest in the Episcopal Church. Students who have demonstrated the qualities exemplified by the Rev. Absalom Jones such as compassion, leadership, service, and interest in education are encouraged to apply. For more information they may contact the Scholarship Fund Committee at (301) 776-5151 or absalomjonesfund@stphilipslaurel.org. 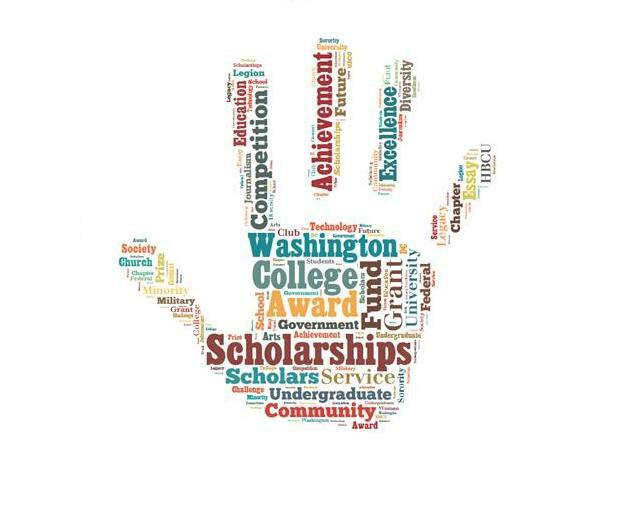 Access the scholarship application here and more information at http://www.stphilipslaurel.org. 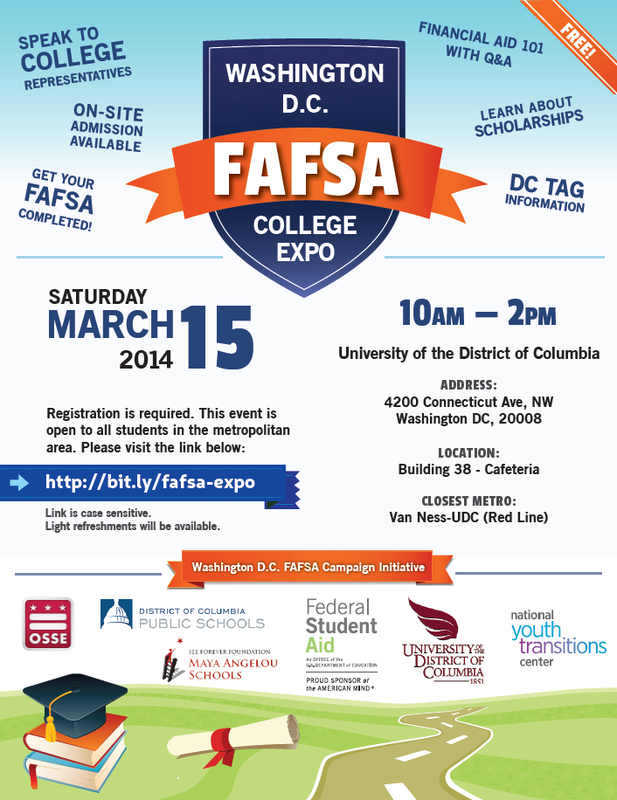 Federal Student Aid (FSA) presents the FAFSA/College Expo on Saturday, March 15, 2014 from 10:00AM – 2:00PM at the University of the District of Columbia (near the Van Ness-UDC Metro)! The event is part of the Washington, DC FAFSA Completion Initiative. This event will provide DC/MD/VA students and families with the opportunity to meet with various college representatives; receive assistance filing the FAFSA; and attend breakout sessions on topics such as scholarships, DC TAG and financial aid 101. Students and families, REGISTER HERE. 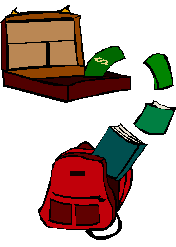 The Jack Kent Cooke Foundation (JKCF) seeks high-performing 7th graders with financial need for its Young Scholars Program. Selected students receive an on-staff educational adviser and services, which may include help planning a suitable academic course load, summer academic and enrichment program opportunities, study-abroad and community-service opportunities, lessons to develop music, art, or other talents, college and career counseling, and the opportunity to network with the larger JKCF Scholar community. If you know any students who stand out for their exceptional academic abilities and achievements, persistence, and desire to help others, please encourage them to visit the Jack Kent Cooke Foundation’s website to learn more. Named for the first African-American to walk in space, ExxonMobil Bernard Harris Math and Science Scholarships are available to 2014 graduating high school seniors in school districts represented by the Council of the Great City Schools. Four scholarships for two males and two females — $5,000 each — will be awarded to two African-American and two Hispanic students on behalf of the former NASA astronaut, physician and businessman, Dr. Bernard Harris. For students to apply, they should click here or access the Council’s website at www.cgcs.org.